Nest is at it again with another update -- this time to the hardware itself. I bought in on this device when the then-slimmer Nest v2.0 was released and, despite its relatively high cost, I've been a very pleased customer ever since. Ok, first off, let's get things straight regarding hardware and software: This post is about the third generation of hardware. 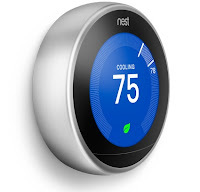 Nest has been around for quite a while (since 2011) and its 3rd generation of software was released way back on October 2, 2012. One of the nice things about Nest has been its attention to routine software updates and improvements. Existing systems get better over time thanks to over-the-air software updates. Nest owners do not have to do anything to receive improvements -- Nest devices simply get better on their own with each update. This blog post is about the third generation of hardware. A number of new Nest v3 features are based on software changes that will also be pushed out to existing Nest owners. This post is therefore only looking at features enabled by the hardware changes. "Farsight" -- it sounds like a Syfy series or a role-playing-game character ability. Actually it is one of the more prominent new features of Nest v3.0. Nest now can detect human presence from a greater distance. This allows Nest to turn on its now-larger display more often when movement is detected. Nest overlooking home security features? Guess what a common issue has been for some Nest users? Placing the Nest in a location where sunlight would warm it during part of the day. It turns out that Nest would sometimes be flummoxed by occasional sunlight. (Side note: I'm fairly certain that's the first time I've ever used the word flummoxed -- someone give me a trophy.) When sunlight would touch upon and warm the prior generation Nest unit its sensors dutifully reported an increase in temperature and would respond by turning on the home's cooling system. Now, however, Nest v3.0 has additional sensors to compare surface temps with internal temps so it can better distinguish between sunlight-induced heat and true elevated temperatures. I'm sure this will be a boon to a number of future Nest owners but I'd guess that most owners, like me, have their Nest in a non-sunlit hallway or similar space so this will only be an improvement for a select subset of owners. This sounds good but, like Nest v1 versus Nest v2, it's not much to write home about. To be exact: The new Nest v3 is only 0.05 inches slimmer then v2. That slight difference is very, very difficult to notice once the device is affixed to the wall. Score "one" for marketing but score "zero" for actual end-user benefit. Ok, now we're getting somewhere. The Nest v3 has a display that is 2.08 inches in diameter. That's 40 percent larger than Nest v2 and is also more resolution: 480x480 versus 320x320. Even if the initial v3 displays are not much more informative than before this improvement lays the groundwork for better information display down the road. Nice upgrade, Nest! Does your Nest have trouble connecting to your wireless network? No? Neither does mine. However, as we add more and more wireless devices it may become harder and harder for Nest to do the wireless part of its job -- namely, allowing you to monitor and adjust it remotely via mobile app and/or web browser. Nest v3 adds 5GHz networking to its existing 2.4GHz capability. If your home wireless router supports 5GHz then the new Nest is that much more likely to stay connected even with an inundation of other wireless devices added to your home environment. One potential game-changer is the addition of a Bluetooth wireless networking adapter. This sounds great but, if recent history is any indicator, this addition may not be as much of a boon as you might think. It turns out that older Nests have already been equipped with a Zigbee chip but, as of this post (September, 2015), that chip remains un-activated and unusable. Likewise the new Bluetooth chip will arrive un-activated and unusable. Kudos to Nest for "future-proofing" the hardware but shame on Nest for not opening up the full potential of the device's hardware -- which has already been paid for by Nest owners -- by allowing these additional features to be utilized by 3rd party developers. Free the Nest! Were you not sold on Nest before? Then you won't be sold on Nest now. I love my Nest and I'd buy it all over again but I fully appreciate that the standard $250 price tag is too much for many consumers. Until Nest adds its next game-changing feature (such as allowing 3rd party developers to integrate via Zigbee and/or Bluetooth) I don't see a compelling argument for enticing new customers at that relatively-hefty price point. Do you own a Nest or are thinking of buying a Nest? Comment below!